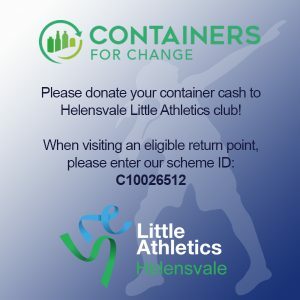 Helensvale Little Athletics holds the weekly competition on a Friday evening, starting at 5:30pm. All athletes will start with a group warm up followed by 4 or 5 events for the evening. These events are rotated throughout the season in a 6 week rotation. Please ensure that all athletes are in full uniform. If they are not in full uniform then they will miss out on competition points for that night. Parental supervision is imperative at every weekly competition, carnival, regional or state event. A child who doesn’t have a parent or guardian present will not be allowed to compete. Sprints: Sprinting essentially involves running at full speed over the full race distance. Little Athletics sprint distances are 70, 100, 200 and 400 metres, however U6’s do not run more than 100 metres, and U7 & 8’s do not run 400 metres. Technically 400 metres is a sprint for older athletes, but perhaps best considered a middle distance race for most Little Athletes. Distance: In Little Athletics these are events run over 800m (U9 and older) and 1500m (U11 and older). Greater endurance levels are required and the running style has to be considerably less vigorous than for the sprints. At Centre meets, they are in general run from a pack start in an anti-clockwise direction on the circular track. Hurdles: U6’s to U17’s are offered Hurdle events at Centre and LAQ competitions. The event is run over 60m (6 flights), 80m (9 flights), 90m (9 flights), 100m (10 flights), 110m (10 flights), and 200m (5 flights) and 300m (7 flights) depending on the age group. Heights vary for age groups: 20cm for U6’s, 30cm for U7’s, 45cm for U8 & U9’s, 60cm for U10 & U11’s, though to 68cm or 76cm U12 to U17’s. Hurdles are built to tumble easily, when knocked, provided they are hurdled from the correct direction. Hurdles must never be jumped from the reverse direction as they will not tumble and could cause serious injury. Relays: Two types may be run – circular and shuttle. In the circular relay, all children run in the same direction around the track with the baton being carried in the right hand (1st runner) left hand (2nd runner) right hand (3rd runner) and left hand (4th runner). Runners 2 and 4 should be towards the outside of the lane when moving the baton. If this is done, changing hands with the baton is not necessary so the possibility of dropping it is reduced. In the shuttle, runners face each other from opposite ends of the straight and pass the baton as they reach their partner waiting at the other end of the straight. Shot Put: The Shot is put from the shoulder with one hand only. At the time an athlete, takes a stance in the circle to commence a put, the shot shall touch or be in close proximity to the neck or chin and the hand shall not be dropped below this position during the action of putting. The shot shall not be taken behind the line of the shoulders. The shot is PUSHED out to land within the marked angle. When the shot has landed, the athlete must leave so that their first step outside the circle is behind the line extending from the sides of the circle. Discus: This is one of the oldest field events, dating back to the ancient Olympics. In Little Athletics, a molded rubber disk is used for all ages, however the U13’s and older may use a steel rim discus at most LAQ competitions. The discus must be thrown from within the circle and land within the marked area. When the implement has landed, the athlete must leave so that their first step outside the circle is behind the line extending from the sides of the circle. Javelin: The javelin is a spear like implement that is thrown from a runway 4 metres in width into a sector area marked by two lines. The event is only offered to athletes in the U11 to U17 age groups. The throw must be completed from within the confines of the runway and the javelin nose must be the first part to hit the ground within the throwing sector. The competitor may then leave the runway from behind the arc and lines on the runway. All throwing implements must be carried back to the throwing area, not thrown. These events are strictly supervised but all must appreciate the dangers of flying implements. High Jump: The athlete’s task is to run up from an approach area and jump over a crossbar supported between two uprights. The crossbar is raised after each round and competitors remain in the competition until eliminated by three consecutive failures. Athletes must take off from one foot only. Note, that up to the U10 age group only the Scissors technique onto scissor mats can be used. LAQ recommended high jump mat specifications may be obtained by contacting the Association Office. Long Jump: Little Athletics uses a 1 x 1/2 metre take-off area for the U7 to U10. Children simply run in and jump from the ½ metre mat into a sand pit. The distance is measured point to point from the front of the take off point to the nearest break in the landing area. The U11 to U17’s use a conventional 20cm take-off board and measurements are taken in the conventional way – i.e. from the FRONT of the board – and at right angles to the front of the board (or half metre “square”) to the nearest break in the landing area. Triple Jump: This is the old “hop, step and jump” and that accurately describes the action involved. The rest of the rules are basically the same as for Long Jump. This event is only offered and conducted for athletes in the U11 – U17 age groups.